Ordered the set and it arrived on the promised delivery date. Easy to assemble with instructions. Counter table with four chairs for that price is a great deal! The Coviar counter table set raises the bar on how beautiful simplicity can be. A wonderfully clean-lined profile is dramatically enriched with a complex, burnished finish loaded with tonal variation and rustically refined character. Cushioned bar stools in a practical faux leather take a classic ladderback design to a new level of comfort.Made with Birch veneers and hardwood solids and finished in a burnished brown finish. Chair, barstool and bench seat are upholstered in durable brown faux leather. D385-223 barstool dimensions: 17"W x 21"D x 41"H. D385-325 chair dimensions: 17"W x 21"D x 38"H. Bench dimension: 38"W x 15"D x 19"H.
Beautiful dining room set - it looks perfect in my kitchen. The table was easy to put together; the chairs not so much. I’m giving this only 3 stars because my chairs were damaged - there was split wood on the back of 1 and a cut on the seat of another. Who wants to send something like this back after taking out all those pieces?? I was very excited to find this beautiful set and thought the price was great. Packaging was good and delivery was timely. There are a million pieces but assembly was not too difficult. If you have a small kitchen or dining room, there are three things to consider when choosing a table: height, adaptability, and shape. Read on to learn how to choose dining tables and chairs that will make the most of your small space. Black dining room furniture can be dressed up or down. Whether you want a glamorous dining experience or a cozy Farmhouse feel, there are many ways to incorporate black furniture into your dining room. Learn how to use versatile pieces like black dining room tables, chairs, and bar carts here. Drop-leaf tables come in many different styles, each of which is compact and functional in addition to being beautiful. Here are the top five types of drop-leaf tables to consider when you have a small dining area. 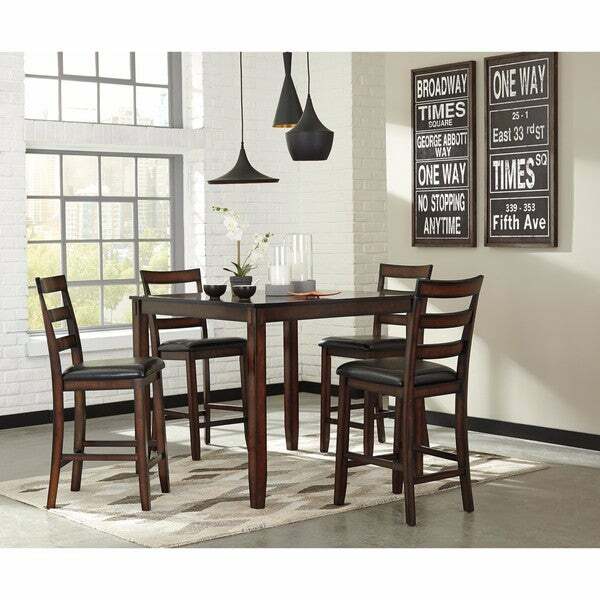 Latest Trends in Dining Table Sets from Overstock.com. Update your dining room with contemporary style! Here are the hottest trends in dining room furniture.